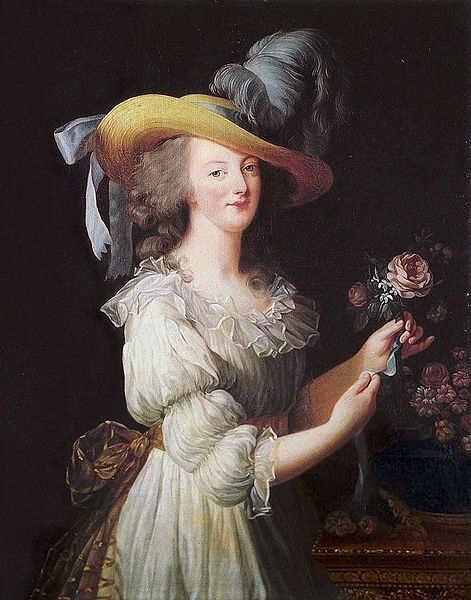 Truth be told, Marie-Antoinette as a teenager and young woman very much enjoyed the outrageous hairstyles of her time, and during all of her years at Versailles she had to wear the court dress for all formal occasions. Alas, that painting, to our modern eye far more modest than the low-cut court gowns, created a full-blown scandal: the Queen had herself painted in her chemise! Imagine, to have an idea of the uproar at the time, the stunned reaction if we were to behold a portrait of the First Lady in her undergarments. It was much worse then, of course, because the royal person was in itself sacred. It was all right, and indeed required, for the Queen to change her chemise in front of the courtiers, or to give birth in public, but being painted in a linen dress was going where no other Queen of France had tread before. Here is a link to a preview and presentation of the Marie-Antoinette program, to be broadcast on History on Thursday, April 25th at 9 pm ET/PT on HISTORY® (Canada), and another link to the preview of Secrets of Versailles.